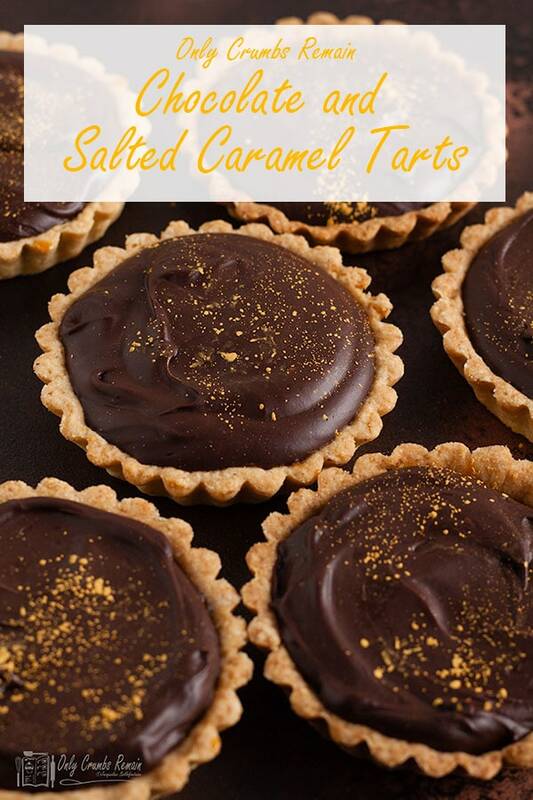 These rich chocolate and salted caramel tarts make a decadent dessert for a special occasion. 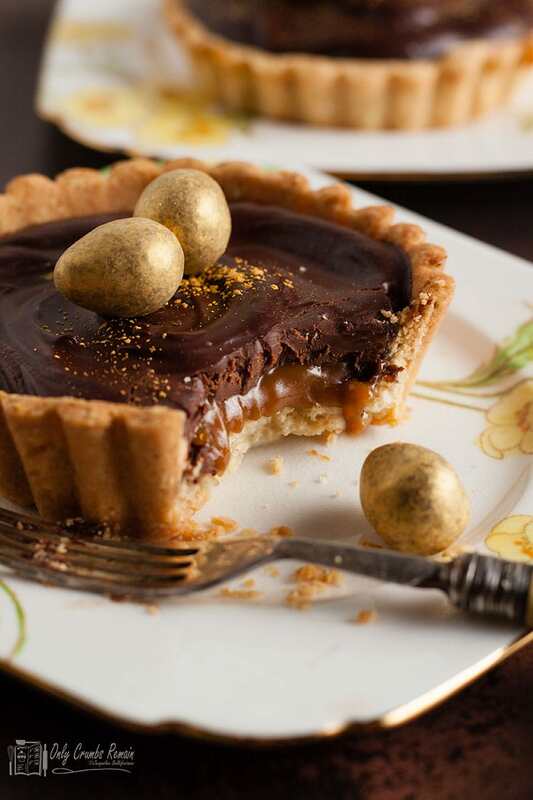 A rich chocolate ganache contrasts with a sweet salted caramel layer inside a hazelnut pastry case. This is a dessert for a special occasion, rich and decadent. If you are a lover of chocolate then these will be right up your street. 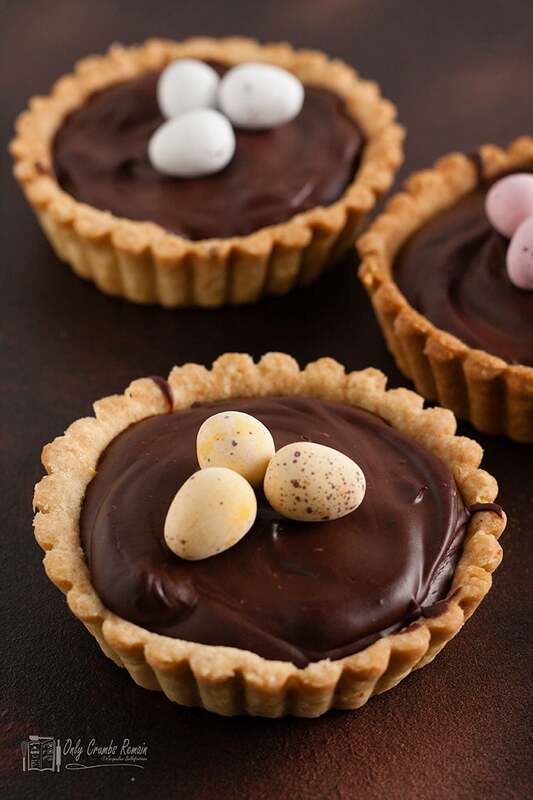 With Easter just around the corner at the time of posting I was looking for a dessert perfect for Easter day and with chocolate being synonymous with Easter these tarts are ideal. My family are grown now but Easter is still a special family occasion, so I was looking to make a dessert that is elegant and sophisticated. To give them a touch of glamour, I decorated with a splattering of edible gold dust and some golden mini chocolate Easter eggs, making them fit to grace the most elegant of tables this Easter. 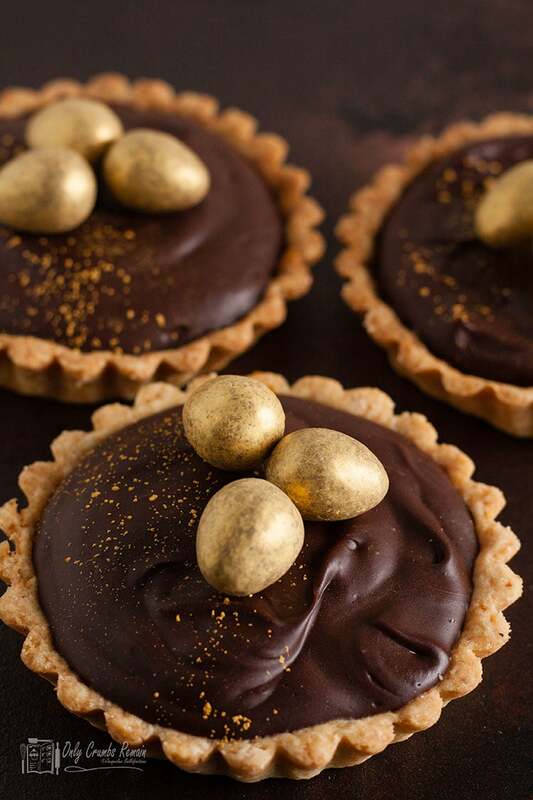 Of course, you can enjoy them at any time of the year in which case decorate them with just a simple dusting of the gold dust, or make some chocolate shards or curls and use those to decorate the tarts. Adding nuts to pastry adds texture and flavour resulting in a delicious crisp pastry. 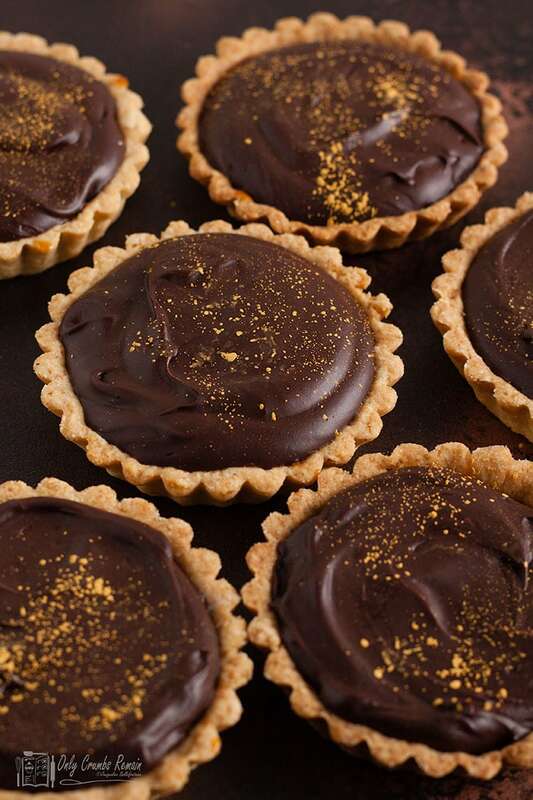 For these tarts, I have added some toasted hazelnuts as hazelnuts and chocolate are a match made in heaven. For convenience, I used chopped ready toasted hazelnuts. To make the pastry you will need to use a food processor as these need to be blitzed with the flour to finely chop but if you don’t have one replace the hazelnuts with ground almond. The contrast of the Sweet salted caramel layer with the rich chocolate is divine. Making caramel from scratch can be a little tricky. For most of my baking, I use golden caster or golden granulated sugar which are unrefined sugars but when making caramel I prefer to use a refined white sugar. It is easier to judge when the caramel is the right colour if you use white sugar. Cane sugar (available in the UK from Tate and Lyle) tends to crystalise less easily than sugar made from sugar beet (most other brands). You can stir the sugar gently until the sugar dissolves taking care not to splash it up the sides of the pan, but once it starts to boil do not stir or it will cyrstalise. Once the caramel is just the right colour, remove from the heat and stir in the cream. Add the cream carefully as it will bubble and splatter. Stir gently and add the salt, then spoon into the baked pastry cases. Instead of making the salted caramel layer used a ready made Salted Caramel spread. I found Bonne Mamans Salted Caramel worked well. The chocolate ganache is intensely rich and the resultant dessert is one that should appeal to more mature taste buds. But it is easy to adapt for children. Replace some or all of the dark chocolate (I used chocolate with 70% cocoa solids) with milk chocolate for a sweeter flavour and decorate with pretty mini eggs. Chocolate ganache and salted caramel in a hazelnut pastry case. A rich and very chocolaty dessert, perfect for dinner parties, Easter and other special occasions. Place the flour and chopped hazelnuts in a food processer and blitz for a few seconds to finely chop the nuts. Add the butter and blitz again until the mixture resembles fine breadcrumbs. Add the egg yolk and 1-2 tbsp water and blend in short bursts until the pastry comes together to form a dough. Cover and allow to rest in a cool place for 15 minutes. Divide the pastry into 6 pieces and roll out each piece until a little larger than the tartlet cases. Gently lift over the tin and ease into the tin to line. Use a knife or roll a rolling pin over the top of the tartlet case to remove any excess pastry. Chill for 30 minutes. Preheat the oven to 200℃ (180℃ fan)/400°F/gas mark 6. Prick the base of the pastry cases with a fork. Line the tartlet cases with baking parchment and fill with baking beans and bake for 10 minutes. Remove the parchment and beans and return to the oven for a further 10 minutes or until the pastry cases are pale golden. Beat the egg white until frothy and as soon as the pastry cases are out of the oven, brush a little egg white on the inside of the pastry case to seal. Place the granulated sugar in a small saucepan with 1 tbsp of water. Heat gently stirring until the sugar has dissolved. Divide equally between the cooked pastry cases and set aside. Chop the plain chocolate and place in a heatproof bowl. Heat the remaining cream in a small saucepan until almost boiling. Pour over the chocolate and whisk together to form a smooth glossy ganache. Divide equally between the pastry cases. Allow to set. Decorate with some edible gold glitter and/or mini easter eggs. Chill until required. Allow to come to room temperature before serving. Brushing the cooked pastry case with a little beaten egg white after baking will seal the pastry case preventing the filling seeping into the pastry and making it soggy. If you do this immediately they come out of the oven, the heat of the pastry will cook the egg white. If yours have cooled slightly before brushing pop back into the oven for a minute. Use ready bought salted caramel if time is short. when making the ganache if the chocolate does not fully melt when the cream is added stand over a bowl of hot water whisking until the smooth ganache is achieved. For a slightly sweeter ganache use dark chocolate with a lower cocoa solid content or substitute some or all of the dark chocolate for milk chocolate. The tartlets will keep in the fridge for up to 3 days. bring to room temperature before serving. Place the flour and chopped nuts in a food processor and blitz to finely chop the nuts. add the butter and blitz until the mixture resembles fine breadcrumbs. Add egg and water. Use the pulse button and blitz until the dough comes together. Gently heat the sugar and water in a pan until dissolved. Boil until the caramel is golden. Chop the chocolate place in a bowl and pour over the cream. Whisk in the hot cream. whisk until the chocolate has melted and the ganache is smooth and shiny. spoon ganache over the caramel and spread level. Decorate with edible gold dust by tapping a brush against your finger to flick the dust onto the chocolate. NEVER WANT TO MISS WHAT’S HAPPENING ON ONLY CRUMBS REMAIN? Why not subscribe and receive an email every time there is a new post. Or follow me on Instagram, Twitter and Facebook. If you make any of my recipes, I would love to see your pictures so don’t forget to tag me. I made these when friends came around for easter and they raved about them. Great receipe and I will certainly make them again. thanks for posting. You have made my day, I love getting feedback like this. So pleased you and your friends love them and thank you for taking the time to comment. If only I could reach into the screen and take one (or two!). They look absolutely fabulous Jacqui and perfect for a grown up Easter treat. (brilliant tip about using Cane sugar for the caramel – I had no idea about that). Using cane sugar was a tip i picked up when I was lucky enough to be given a days private master class on sugar pulling and sweet making when I was writing for Something Sweet Magazine. and your tarts are beautifully decorated!